Crown Pointe East Crown Pointe Homes: H.14343 Enjoy the morning sun at your pool overlooking the lake! This beautiful, well kept home offers a brand new roof (2019). New pool enclosure, water heater, appliances, pool pump, salt water salinator and irrigation controller. Hurricane shutters, tile floor, and much more makes this some special. Crown Pointe offers a variety of amenities: Clubhouse, tennis, pickle ball, community pool, fitness room and fishing pier. Less than 5 miles from the beach and 5 Ave. with all the wonderful shops and restaurants. Crown Pointe East Crown Pointe Homes: MOTIVATED SELLER!!! This renovated house in beautiful Naples, FL is a must see. House offers so many interior upgrades with brand new plank tile through the entire home, new kitchen renovated with beautiful granite countertops, 48in cabinets, brand new stainless steel appliance package, modern bathrooms with plank tile, new vanities, new granite, new backsplash, new shower work, new toilets, freshly painted entirely with Sherwin Williams paint and brand new large baseboards. Exterior offers front screened entry with rear offering a private preserve view by your amazing lanai and pool perfect area to sit back and enjoy while on vacation or after a long day. This one is amazing the HOA is LOW in the community only $217 quarterly WOW! Location Location Location with minutes to beaches, shopping, dining, entertainment, schools and right around the corner for the highway (I-75). Crown Pointe East Crown Pointe Homes: H.14462 Watch the spectacular sunsets from this impeccable maintained lakefront/pool home with western exposure. Move-in ready! The house is built on an over sized corner lot and the many upgrades include: New refrigerator, stove, tiles throughout, driveway and walkway with pavers, irrigation well (which saves you a lot of money on water) central vacuum cleaner, electric/manual hurricane shutters, hurricane garage door. Beautiful resinous garage floor. Crown Pointe is located less than 5 miles from the white beaches and 5th Ave South with all the great restaurants and shops. It also offers great amenities: clubhouse, community pool, fitness room, sauna, tennis, pickle ball and a fishing pier. Crown Pointe East Crown Pointe Homes: VIEWS....VIEWS.....VIEWS......LONG LAKE VIEWS.....UNIQUE EUROPEAN DESIGNED HOME......LARGE OUTDOOR LIVING AREA THAT FEATURES POOL, SPA, OUTDOOR KITCHEN, LARGE UNDER COVER AREA, AND STUNNING LAKE VIEWS........A SECOND FLOOR BONUS ROOM / OBSERVATORY.........3 BEDROOM PLUS DEN DOWNSTAIRS......EXTENDED TILE FLOORS.......PREMIUM LARGE LOT......EXCELLENT LOCATION, CLOSE TO DOWNTOWN 5TH AVE, MARINAS, RESTAURANTS, SHOPPING, AND BEACHES........VERY LOW HOA FEES AND COMMUNITY OFFERS TENNIS, CLUBHOUSE, POOL, FITNESS ROOM, AND SOCIAL ROOM.........PRICED TO SELL.....EXCELLENT OPPORTUNITY FOR SOMEONE WHO WANTS A UNIQUE HOME. Crown Pointe East Crown Pointe Homes: H.14423 This well kept lakefront pool home has southern exposure and is located on a cul-de-sac. Light and bright. Offered turnkey furnished. Hurricane shutters. Located in Crown Pointe, which is less than 5 miles from the beach and 5th Ave S. with all the fine restaurants, theater and shopping. Crown Pointe East Crown Pointe Homes: This attractive corner lot pool home boasts volume ceilings, tile floors, casual and formal dining areas, a spacious living room and a large master suite complete with a walk-in closet, a soaking tub and separate shower. An over sized lanai with a large heated pool completes the picture of the perfect Florida lifestyle! Crown Pointe is a friendly, well established neighborhood conveniently located just a few minutes from the beach and the shops and fine dining of Old Naples. Crown Pointe residents enjoy numerous amenities including a clubhouse with a community pool, sauna, exercise room, tennis courts and a beautiful 37 acre lake. Association fees are only $251.00 a quarter. Crown Pointe East Crown Pointe Homes: Reduced $14,000!! Looking for gem? Well look no further this rarely occupied, immaculate 3BR, 2BA is ready to move in. With an open floor plan and generous size rooms it makes entertaining your guess easy. Granite countertops, stainless steel appliances, tile/hardwood floors gives the home a modern feel along with the furnishings. A new roof was put on in 2018. The property is being offered turnkey. Crown Pointe offers great amenities, including a newly renovated clubhouse overlooking the lake, community pool, exercise room, billiards, Pickle-ball, tennis and a fishing pier. Located only 4 miles from the white beach, 5th Ave. shopping, dining and Sugden Community Theatre. Crown Pointe East Crown Pointe Homes: H.14346 Wonderfully bright and sunny pool home, just minutes to downtown Naples. Impeccably maintained by the current owners, this great property includes many recent upgrades such as newer A/C, appliances, & pool screens, plus new hot water heater, garbage disposal & more. Other great features include vaulted ceilings in all living areas & master-suite, plantation shutters, & custom closet built-ins. Wonderful home for entertaining, with a spacious covered lanai overlooking the 14x30 sunny pool & beautifully landscaped and private garden. This home is move-in ready with a white and bright décor throughout. The Crown Pointe community with it’s incredibly low fees, has a lakefront Clubhouse with heated pool, 3 lighted tennis courts, fitness center with sauna, & changing room, all overlooking a gorgeous 37-acre freshwater lake. All this, within a 10 minute drive to 5th Avenue and the beaches! Crown Pointe East Crown Pointe Homes: Beautifully maintained 3 bedroom 2 bath Ranch in highly desirable Crown Pointe Community. 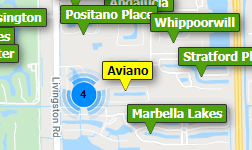 Crown Pointe is a 10 minute drive to downtown Naples and a 30 minute drive to Marco Island. Crown Pointe is adjacent to the Rich King Memorial Greenway Bike Path. This home has beautiful landscaping with private backyard and spacious Lanai. Lanai has fully automated electric storm shutters. Home features include master suite with bathroom featuring separate Jacuzzi tub and shower. Home has updated AC system replaced in 2016, hot water heater replaced in 2014, and a brand new roof replaced in 2018. Community amenities include a Clubhouse, Community Pool, Community Room, Exercise Room, and Tennis Courts. Very affordable HOA fees are another benefit of this community. Royal Villas Crown Pointe Homes: Beautiful home. This attached Villa is in the Royal Villas at Crown Pointe. It has 3 bedrooms and a 2 car garage. The home is set up for wheel chair accessibilty. The community has a clubhouse ,pool. Granite kitchen tops. New roof in 2018 and all appliances come with this home. Extended Lanai. Many extras. Royal Villas Crown Pointe Homes: This is an auction, Come check out this nice 2 bedroom 2 bath condo in Naples. Step inside to find vaulted ceilings, open floor plan, tile floors, separate dining area, an open and spacious kitchen, attached garage and screen lanai. The community offers pool and fitness and convenient to nearby dining, shopping, downtown Naples and a short drive to the beaches. This one will not last long take a look today!